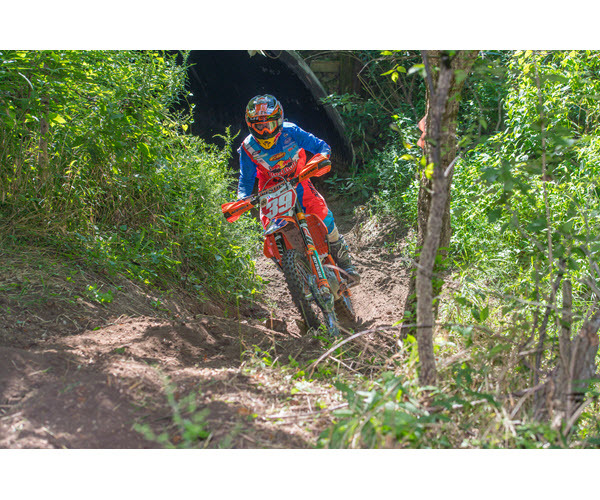 MATTHEWS, IN – FMF KTM Factory Racing Team’s Russell Bobbitt came away with his first podium of the season at round six of the Kenda AMA National Enduro Series after claiming an impressive runner-up place finish at this weekend’s Muddobbers National Enduro in Matthews, Indiana. Bobbitt, a five-time national champ, got off to a quick start in the morning by laying down the fastest time in test one, finishing the 11-mile test on his KTM 250 XC-F two seconds faster than KTM support rider Steward Baylor Jr. of SRT Racing. Bobbitt was never outside the top three in any of the remaining tests except for the sixth and final test where he got stuck in a mud bog and lost considerable time to eventual winner DuVall. Bobbitt went into the final 10-mile test sitting five seconds behind DuVall in the overall results and was “on a burner” when he hit the goo and lost ground. In the end, Bobbitt finished the event 21 seconds out of the lead. Baylor, who also got off to a quick start, took a nasty, high-speed tumble in the second test of the day and spent the remainder of the day trying to regain his momentum, eventually finishing the event in fourth. In addition to Bobbitt’s second place and Baylor’s fourth, three other KTMs filled the top 10 with Integrity Acquisitions-backed KTM rider Evan Smith claiming fifth, KTM support rider SRT Racing’s Cory Buttrick in sixth and Solid Performance KTM’s Jesse Groemm in seventh. With the runner-up finish, Bobbitt moved into fourth overall in the series standings, while Baylor remains second overall, 16 points out of first.